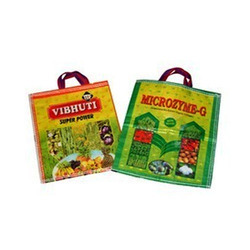 Our range of products include multicolor woven bags & packets. We are the leading manufacturers and exporter of Multicolor Woven Bags & Packets and our product is made of good quality. These bags are manufactured using most up to date and sophisticated technology and high-grade raw material acquired from most reliable vendors. These are manufactured and offered in the market in varied sizes, shapes, and capacities. We also customize these multi colored woven bags as per the requirement and specification of our customers spread worldwide.